Posted May 30, 2016 by Kate Kloppers (formally Sutherland) & filed under CSAG blog, Frontpage. I have just had the fortunate opportunity to participate in a 2 week summer school run by the STEPS Centre at the University of Sussex in the UK. STEPS stands for Social, Technological and Environmental Pathways to Sustainability. It is this pathways approach that is at the heart of the summer school. I am writing this blog as one attempt to process the wealth of knowledge, information and experience that I have encountered over the last 2 weeks. My reflections relate to 3 aspects of this encounter, or more accurately set of encounters. The first is the content of the summer school. The second is the format of the summer school. And the third is the nature of the STEPS Centre. 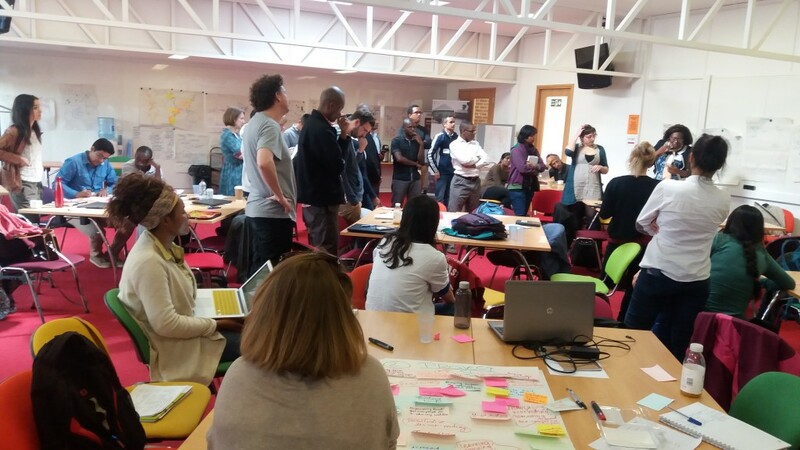 The content of the summer school centred on an approach to analysing and facilitating various means of creating a more environmentally sustainable and socially just world. The STEPS approach is based on recognizing that there are numerous complex dynamics at play in any given place (including across various scales). Consequently, we have incomplete knowledge of all the risks associated with any given course of action and there is always potential for surprises (i.e. occurrences and/or outcomes that are unanticipated). At the same time, people hold a diversity of goals and values by which they make choices, or would make choices if given the chance. People thereby conceive of problems differently and perceive different actions or solutions as desirable. Within this diversity certain groupings dominate, while others are marginalized. As such, certain ways of seeing problems and preferences for particular interventions and outcomes tend to obscure or drown out others. This results in losses and instabilities within society and the broader environment, or the socio-ecological system as a whole. For example, water shortages emerge in a neighbourhood on the outskirts of a big city because irrigated agriculture is being expanded upstream, there have been a number of years of below average rainfall, groundwater is being heavily extracted by a drinks factory nearby and the pipe network from the dams feeding the central city does not extend to this area. The dominant response might be to let the agricultural sector continue expanding and the factory continue extracting to increase the creation of jobs and tax revenues, or at least avoid losses, and to secure a public loan to extend the water reticulation infrastructure network. But this could be excessively costly both to the national fiscus and the many households who cannot afford monthly water service fees. It will also compromise the livelihoods of informal water sellers currently meeting basic demands. It also does not address the ecological consequences of over-extraction from the river and groundwater. To counter such dominant patterns of thinking and action, the STEPS approach encourages researchers, as well as other actors, to think about and employ methods to ‘broaden out and open up’ decision-making processes. More ways of knowing, more alternative options, more courses of action, and more stakeholders and actors are thereby included. Doing so increases the chances for learning, fostering creativity, creating new alliances and finding ways forward that are more widely beneficial and desirable. Ways that address a variety of needs and values (not only those of the most powerful), while remaining open to being changed as conditions change. The STEPS approach very explicitly rejects thinking and acting as if it’s possible to control each other and the world that we live in. Rather it is about appreciating and working with plurality and being reflexive about the political dimension of this type of work. What it entails to be sustainable was hotly debated throughout the 2 weeks. The fact that there is not consensus on a single definition of sustainability is at the heart of the STEPS approach. Rather the focus is on recognizing and surfacing multiple perspectives and the values that underpin these in order to identify numerous pathways and deliberate more inclusively over the preferences held and choices to be made. Aside from the subject matter, the summer school is designed to include a variety of types of sessions. Traditional lectures and seminars were complemented with walkshops chatting our way through the countryside, open sessions of free-flowing group discussions around various topics of interest, and a participant-led conference that was afterwards renamed a talent show. Together these provided a rich learning environment, full of thought-provoking performances, deliberations and debates. The summer school attracts applicants from far and wide, so we had a group of about 40 participants coming from all over the world who are early career researchers in all sorts of disciplines, fields, sectors and organizations. I learned so much from the reflections, insights and questions shared by the participants. The only trouble with all these amazing sessions and inputs is that there was so much ‘broadening up and opening out’ that I am left feeling somewhat overstretched. Hence the motivation to write this blog as one step in gathering my thoughts. I am sure many more thoughts will condense around the seeds planted over the last 2 weeks, and probably some will evaporate too! From my intense but admittedly brief encounter, what struck me about the STEPS Centre is a sense of togetherness in terms of thinking and working together. Even though each person involved in the summer school works with different disciplines, topics, concepts, methods and places they debate, critique, contribute to and build on a shared framework and/or approach. They have been doing so for many years now, across numerous projects. Hearing many of them present, and chatting with them during open sessions and social events, I got the feeling that there is a productive amount of coherence within and between their work, achieved through balancing independence with collaboration in their research, teaching and especially writing. This togetherness and coherence is sometimes missing in other research groups I have encountered and worked with. I think it enables the researchers at STEPS to contribute something much bigger and more valuable than simply the sum of their individual parts. An aspects of STEPS I found inspiring. My huge thanks go out to everyone who made this possible and such an amazing experience: the STEPS team, the summer school participants, my PhD supervisor, my FRACTAL colleagues, and last but definitely not least my husband and extended family who cared for our little one. One of the many for whom we are striving to build a better future, through diverse and inclusive means.